»Interview»I’m Not Kidding You. This is an Interview with Peter Gelb. Since becoming General Manager of the Metropolitan Opera in 2006, Peter Gelb has changed the Met’s place in today’s culture. New productions, new operas and new singers are only some of the things Mr. Gelb has instituted during his tenure at the Met. He pioneered the Live in HD Broadcasts, started the Sirius XM Met Opera Radio channel and recruited some of the words most renown theater and opera directors to leave their mark on the classic — and not so classic — operas he overseen productions of at the Met. Recently, I was fortunate enough to be able to talk to Mr. Gelb about his involvement with classical music, his time at the Met, and how he wants to leave his mark on an art form so many feel so passionate about. My questions and his insightful answers are below. How did you become interested in opera? When I was sixteen and in high school, I worked as a part time usher at the Met. I worked one night a week and the Saturday matinee. On the weekend, I was in charge of the Family Circle standing room and that was my first exposure to opera on a regular basis. My job was to keep the peace between the standees, who would get into fights sometimes. I had to keep them quiet or sometimes I had to call in the safety forces that were off-duty firemen. That was the first time I heard Renata Tebaldi or Franco Corelli and I heard them in Fanciulla. That was when I first heard Leontyne Price, as well. I was exposed to the great stars and the magic of the Met and the grandeur of the house. It was the golden age of voices and between what I heard and what I saw, it seemed like the most exciting place to be. My part time ushering days inspired me to spend my life in the performing arts. Instead of going to college, I went to work as an office boy for impresario Sol Hurok. I was an assistant mail room boy at 17. I went to college briefly but went back to work three years later. I was at Yale for a semester and they made me the director of information for the Yale School of Music. The Met has pioneered live movie transmissions with its Live in HD series. How has this advanced the company? The reason why we began the Live in HD program or other initiatives was to keep opera alive. There is a fear, that based on the advancing age of the audience, opera will not sustain itself unless it becomes more popular. Twenty or thirty years ago, opera was much more popular than it was today. Beverly Sills used to host the Tonight Show when Johnny Carson was out of town. These days, it’s unthinkable that an opera star could host a TV show. Not because they’re incapable, but because they’re just not as popular as they once were. Everything I am doing is to maintain the high standards of music the Met has set by having the greatest singers in every role. The Met has a better batting average than any other house in the world based on talent of the singers and a lot of knowledgeable opera fans take the Met for granted. It’s a tradition we’re long known for. It’s also essential that opera be directed. My job is maintaining the high standards and advancing it theatrically. We make it modern by applying a contemporary aesthetic. There are high standards to all facets of the company. We make it as accessible as possible through public programs, Sirius XM Radio, Live in HD, open dress rehearsals and the festive holiday performance. All we have to do is stimulate public interest and the Live in HD program has done that. It has quadrupled the audience. 700,000 people see us live each year and now three million people see us in theaters. What are the benefits and drawbacks of casting and planning a season as far as five years in advance? The major benefit is to secure great talents. Of course there is always the possibility that it might not turn out the way you want to. Opera is full of uncertainty. My job is to gamble intelligently in casting for both new productions and revivals. We have to act boldly and if we don’t take risks and gambles then we lose our possibility of achieving real success. With every success comes something less successful. Everyone has an opinion. What goes into planning a season? We have to find the right mix of repertoire in revivals. 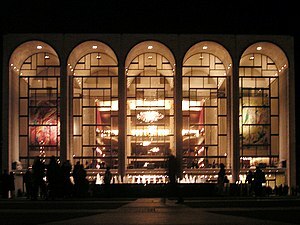 The Met is famous for being eclectic in its new productions and revivals. We need to be, because of the Met’s large subscription base, to give the audience the variety it wants to experience. There are always operas by Puccini, Verdi, Wagner, and Strauss most of the time, something French and some Mozart. Since I’ve been here, I require a new work every season, like we have Nico Muhly’s Two Boys next season. Before I arrived here, a John Adams opera hadn’t yet been produced at the Met or Glass’ Satygraha. Since I arrived, there has been an emphasis on new work that was missing in past decades. We don’t repeat works too often, and no opera has an unlimited capacity. When casting for new productions, we give priority to senior singers. Take for example, Anna Netrebko. She contacted me that she wanted to sing Tatyana in Eugene Onegin, and I thought that that might be a good reason for a new production for her. When I first heard Kaufman sing Parsifal in Germany, I went backstage and told him that we would do a Parsifal for him. We don’t just do a new production because a singer wants it. The choice depends on what piece needs a new production and you can’t do Parsifal without a good Parsifal. There would be no reason and the opera is hard enough to cast as it is. What’s a bigger priority at the Met: singers or specific operas? It would be hard to separate one from the other. Singers are the most important and we want to find the right vehicles for them. My job is like a matchmaker lining up repertoire, directors and singers in right combinations. Those combinations come directly from singers telling us what they want to sing. The Met has to make sure that each major star on the grid sings here as often as possible. We have to plan four of five years in advance and we have to be ready for last minute changes when singers don’t develop the way we want them to. For example, we cast Karita Mattila in the new production of Ballo, and her voice did not go that way we predicted. It wasn’t the right role for her and she knew that, so she withdrew. What is your rationale behind new productions? Why are they a priority for you? New productions are necessary to stimulate public interest. New productions are the tent poles of a season and they provide by interest and stimulation for both the artists and the public. The choices are determined by artists, singers and directors. Take for example how William Kentridge came and did The Nose and Patrice Chereau did From the House of the Dead. We wanted them to work here. New productions are good. They sell more tickets than the old ones. Of course, with more tickets, comes more risk. That is how we know if a production is successful or not. If we don’t present new productions, it’s like saying opera is dead and nobody wants that. The Met is committed to introducing opera to younger students. Would you consider changing the student ticket policy to younger students as opposed to only college and up? Where do you want the Met to be in five years? Ten? I would like it to be open. I would like it to be continuing on its path of presenting new works and new productions to stimulate the public and their discussion about opera. It’s important not only just for the Met, but for all companies to remember that they are representing a public art form. There are a lot of challenges in staging opera. The cost of running it is astronomical and we can’t rely on government funding. The cost of labor and production materials is always going up. It’s a tough battle to keep opera alive both artistically and financially. How has the Met used the press as a positive means of promotion and publicity? The press has their own agenda and they decide what they want to do. We don’t control the press. However, the press is motivated to cover new and different things. Such is the nature of journalism. New productions provoke journalistic coverage. When the Met makes artistic news like with Live in HD, the press responds. What have your goals been for the Met been during your tenure? What do you want your legacy to be? My entire life my goal has been to create connections between the art and the public. My specific goal for the Met has been to reach the public on a greater basis. I’m a populist who believes that the future of high art lies in reaching as many people as possible. Hopefully my legacy will prove that. ← An Interview with Ildar Abdrazakov! Funny, I must have, as an “opera teen” myself, seen Mr. Gelb hundreds of times while standing in the Family Circle at the Met during those years. This also reminded me that when the current Met opera house was new, I imagined that one day it would become a giant, state-of-the-art sound stage, with no live audience (!! ), but that every night there would be a performance broadcast live on “pay TV” (cable was in its infancy then, and the Internet was unimaginable), which people could subscribe to just as they did – and do – for tickets (10 Tuesday nights, etc.). At the time, I thought this would be a good thing, although now of course I wouldn’t dream of writing off the live experience. But what I was predicting is close to what we now know as the Live in HD series. I wonder if Mr. Gelb had the same dream back then? P.S. Good job and all that, OT! Wow! Great interview! So much to think about from this and, wow, so much STUFF! I will now go and sit in a corner and ponder thoughtfully on these words that you have provided us with. Youve done a great job capturing all this without a tape recorder. It really provides some insight into how Mr Gelb thinks about his job in the Met and what goes into the choices of different operas. Well done. Fantastic interview! So much to learn from a talented director. I second the idea of expanding the age limits to allow younger students to obtain student discounts. I think with all of these outlandishly modern productions of some operas, that eventually this great institution will disappear. He’s already spoiled productions of Ballo, Rigoletto, and Traviata. Your interview with Peter Gelb is astounding. Congratulations! If you become general manager of the Metropolitan Opera, I want to be your assistant! What a fantastic interview! I so envy you for it! Great, great job! Reblogged this on Il Dolce Suono. Well done, Harry – Just found your blog and look forward to seeing more of it. Happy Holidays.